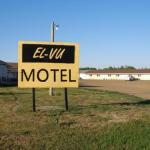 Featuring free WiFi El-Vu Motel offers pet-friendly accommodation in Bowman. Free private parking is available on site. The rooms come with a flat-screen TV. Some units have a seating area where you can relax. All rooms include a private bathroom fitted with a bath.